Thetis Lake Regional Park features several lakes with trails that lace through the beautiful forest, linking the various bodies of water. It is a very popular spot in the summer as the beach and lake, accessible directly from the parking lot, are perfect for a sunny day. There may be some fees for parking during the busy season. 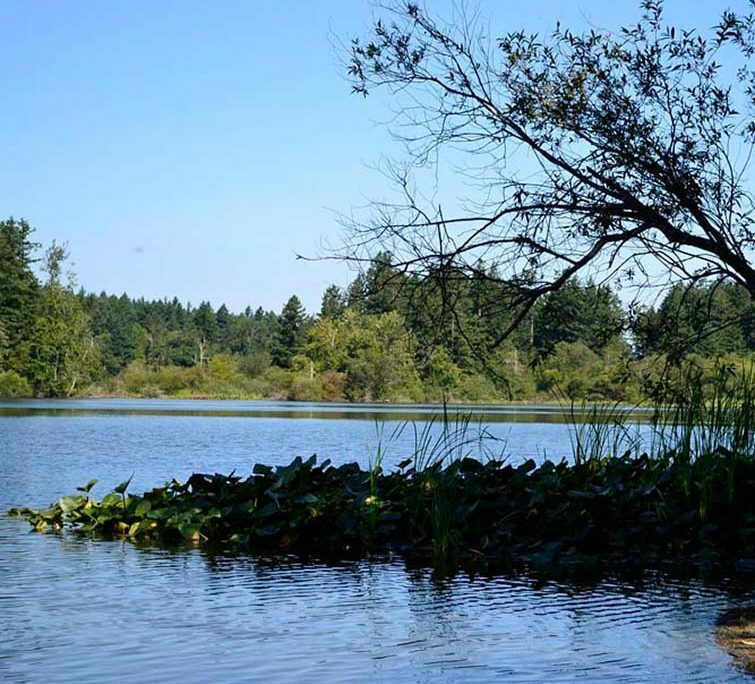 Discover more about Thetis Lake on our lakes page. With 5km total of fairly easy-going trails and boardwalks, Witty’s Lagoon is the perfect destination to enjoy the outdoors and some brilliant West Coast scenery including Sitting Lady Falls. The trails can be broken up into smaller sections and can be avoided completely if the day’s goal is to just head to the lagoon-side beach. A perfect park for beginner hikers, the Uplands Park gravel trails loop through the 30 hectares of land and can take you all the way to Cattle Point, a fantastic, sandy beach to spend the afternoon. Bikes are prohibited keeping the high concentration of rare plant species safe. The trails offer beautiful ocean views, as well as an opportunity to learn about the natural surroundings and Gary Oak meadow ecosystem. Featuring boat launch ramps, a War Memorial, benches, picnic tables and a scenic waterfront drive, there’s something for everyone and it makes for a great day or sunny afternoon. Linking Beaver and Elk Lake are a series of multiuse trails that take visitors through various types of terrain including forest, fields and wetlands. The 5km main trail from Beaver Beach to the Brookleigh boat launch is constructed out of smooth gravel and has areas for fishing, swimming, cycling and to take a break with a scenic view. You can wander the other side of the lake to complete the 10km trail and spend time exploring the other lakeside web of light trails between Beaver and Elk Lake. For more information on Elk/Beaver Lake, visit our Lakes page here. Francis/King Regional Park is a great hiking destination for those who want the scenery, without all the work! Around 11km of trails weaves its way through wildflower meadows, soft woodland and towering old growth trees, such as in Heritage Grove. 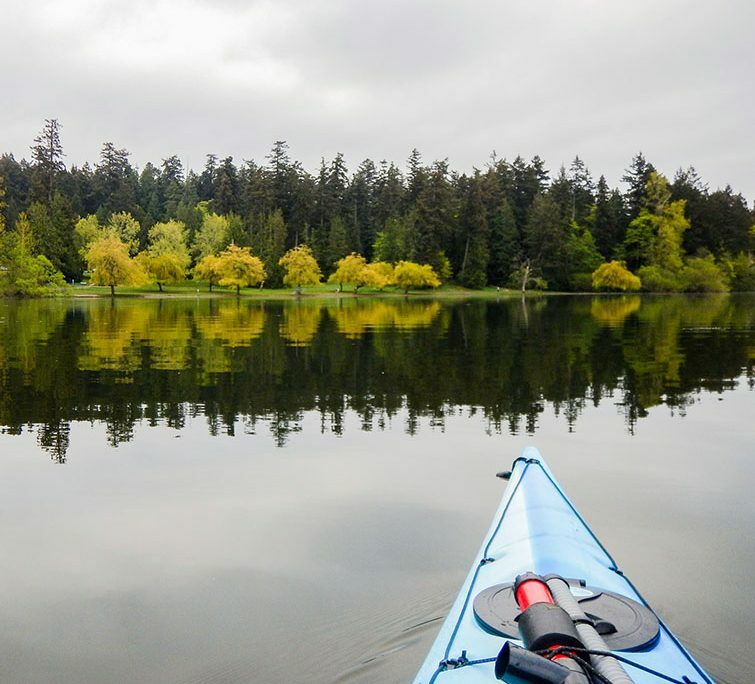 Some trails even connect to Thetis Lake Regional Park, and with so many options, you can easily spend an entire day between parks taking in the scenery. One of the top trails, however, is the Elsie King Trail, which is an 800m interpretive loop trail fit with a cedar boardwalk. It’s the perfect spot to take children, and those in wheelchairs or with limited mobility. The park also feature a Nature Centre, which helps out those who are a bit directionally challenged find their way. For a dash of two ecosystems tucked into an urban environment, pay a visit to the Swan Lake Christmas Hill Nature Sanctuary. A spider web network of trails takes hikers through Swan Lake’s marshland, or over to the highlands and through the Oak Trees of Christmas Hill. The Christmas Hill Hike takes you up just over 100m and overlooks Swan Lake, while the marsh side offers a 2.5km loop that takes you around the entire lake. A Nature House at the main parking lot ensures you set off on the right foot and learn as much as you can about the unique ecosystems you will be wandering through. To do it all, you’ll cover 5km and need about 2 hours. The lake loop especially is an easy feat, with little to no elevation throughout. Although the summit is also accessible by car after 12pm every day, hiking up to the top of Mount Doug is also a great option. Just a short distance from Cordova Bay, it offers a varying hiking trail that treats you to a brilliant 360-degree view of Victoria once completed. Off of one of many of the winding trails, there is also an abandoned mining cave that hikers can explore, although a flashlight may be required. Mount Douglas boasts the title of being the largest park in the Saanich area and its trails are extensive. Depending on which you choose, the elevation, length and difficulty can vary, although none are necessarily overly exertive. Some of the trails even connect you to the beach and mountain, so you can make a full day out of the excursion by visiting both. Be sure to pick a parking lot that reflects the trails and terrain you’re looking to explore. Mount Tolmie is a favourite of University of Victoria students, thanks to its proximity to campus. Like Mount Douglas, Mount Tolmie is accessible by car, even up to the very top, but the short hike makes the 360-degree view of the city even more rewarding. There are numerous parking lots on your way up as well, so if you still want a bit of work, but not the full hike, you can park halfway up and enjoy a bit of a sweat. There are a few branching trails to give you a number of loop options, and the main loop from the bottom lot to the top and back is just over a kilometer long. Located near Sooke Hills, the Mount Wells Summit hike is perfect for those who want a challenge. The steep 352m trail rewards hikers with stunning views of Juan de Fuca Strait, the city of Victoria and the Sooke Hills. Along the way to the summit are two sightseeing pit stops that give you both a chance to catch your breath and lose it all over again to a wonderful view. Brilliant wildflowers located in this protected region guide the way in the spring along trails that lace through Douglas Firs and Garry Oak to the open hilltops. Being a wildlife refuge as well, black-tailed deer, red squirrels and alligator lizards are some of the many different creatures that will accompany you along the way. The 123 hectares of parkland was established in 1994 and its Langford location is definitely worth the drive for those who love to hike. Located just outside of the Gowlland Tod Provincial Park, Lone Tree Hill is another rewarding, yet quick, hike. Rather than looking out over Victoria, however, it grants you sweeping views of the Juan de Fuca Strait, the Gowlland Tod Provincial Park and Victoria’s Highlands region. Of course, such a fantastic view requires some work. The 1.6km round trip ascends about 100m, lulling you into a false sense of confidence with its fairly level start. This short trail is best enjoyed on a clear day in order to see absolutely everything of the stunning view. There are several side trails that take you to private out-crops on the hill, and despite being such a short trail for its scenic reward, you’ll often find yourself alone except for the lone Arbutus at its top. While definitely a lone tree, the Arbutus is not the tree after which the hill was named. Originally, a 200-year-old Douglas fir sat on the hill, but today all that remains is its stump. The Bear Hill summit is about a 30-minute hike that leads you to a spectacular viewpoint overlooking Mount Baker, Haro Strait, Sydney and the Gulf and San Juan Islands. Just north of Victoria on the Saanich Peninsula, the entire park consists of 48 hectares and is home to many types of trees, animals and wildflowers making it a popular destination for tourists. The summit trail itself winds through Douglas Fir forests and can be steep in some areas. Open to hikers and horseback riders, it is a great place to spend an afternoon. 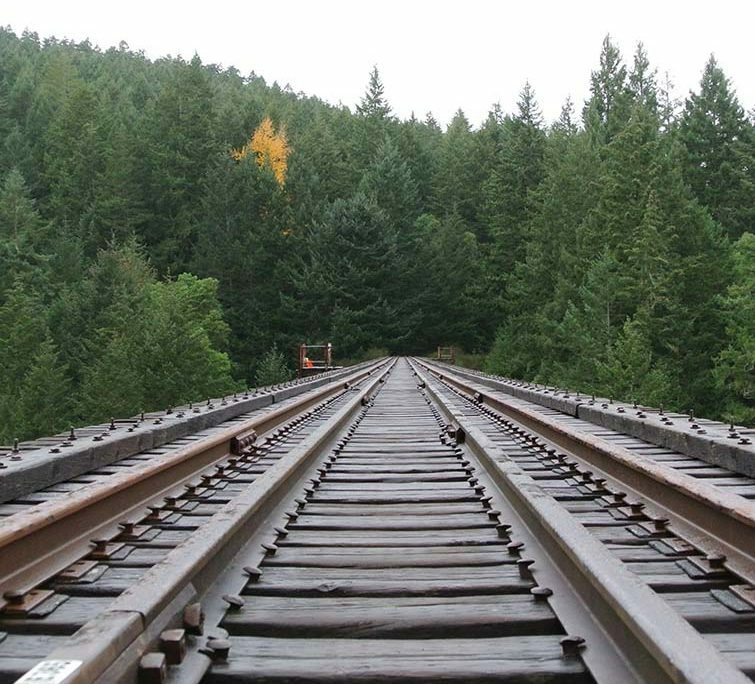 Although a bit farther outside of Victoria than some of the other hikes at 15km away, Goldstream Park is a “cannot-miss” of the area and is arguably one of the most popular and beautiful parks to explore on Vancouver Island. 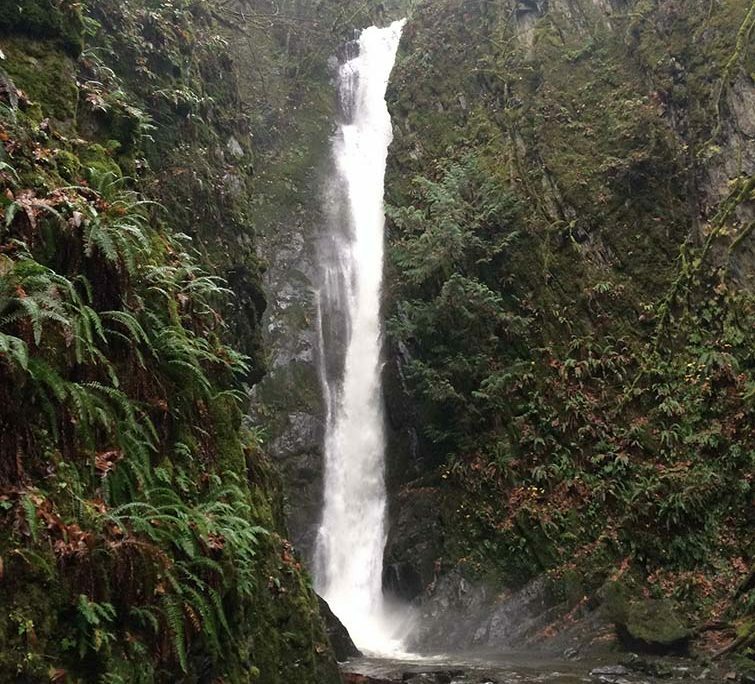 Not only does it feature the numerous different types of terrain offered by the temperate rainforest, Goldstream gives hikers access to beautiful waterfalls, sweeping forests, extensive wildlife such as spawning salmon and has picnic areas and camping. With a rugged and steep trail to one of the highest peaks on the Island at 419m (1375ft), the hour-long Mount Finlayson hike shows off panoramic views of Victoria and the surrounding region. Easy trails branch off to various waterfalls including one known as Niagara Falls whose height almost reaches that of the falls after which it was named at 47.5m, and to an abandoned goldmine from the days of the Gold Rush. 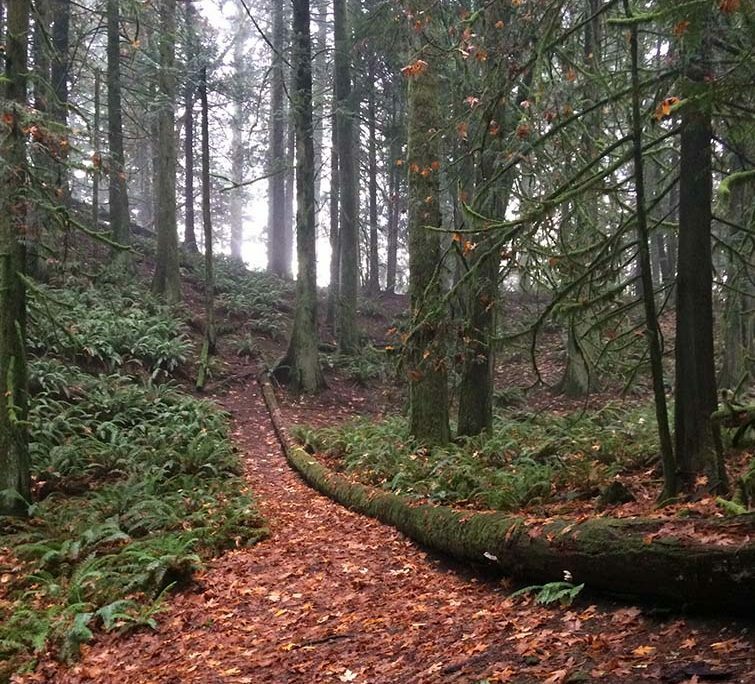 Massive old growth trees such as Douglas Firs, Western Red Cedar, Hemlock, Yew, Big Leaf Maple and Black Cotton Wood as well as beautiful wildflowers accompany you on your journey and the 16km of varying levels of trails provide something for absolutely everyone. Offering more than 25km of trails, this beautiful Provincial Park provides something for all difficulty levels. The Gowlland Range overlooks Finlayson Arm, a fantastically unique fjord, as well as offers magnificent ocean-side views of the Inlet, as well as of and along the fjord. The Mount Work trail offers the most challenging hike and is 5km in length to the summit, which opens up to sweeping views of the Tod Inlet. This park’s Brentwood Bay location, right nearby the Butchart Gardens, makes it extremely accessible to those staying in Victoria and its large area makes you feel miles away from the city. It’s a perfect place to take a break and experience the wild, British Columbia outdoors. For a more extensive list of some of the top hiking trails in Victoria and the rest of Vancouver Island, check out this page on www.DiscoverVancouverIsland.com!